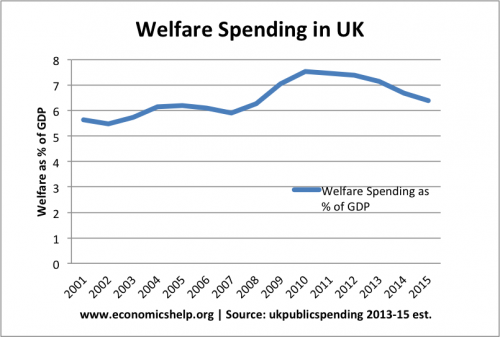 Welfare spending in the UK is a controversial topic. There is significant political and public concern at the growth of welfare spending in the past few decades. In particular, there is a fear that the growth of the welfare state is encouraging a ‘dependency culture’. But, how much has welfare spending actually increased by? Are we really a nation of scroungers or is the extent of welfare payments exaggerated? One important point to bear in mind is that in a recession, we expect welfare spending to increase. That is really the whole point of the welfare state – to provide a minimum income during a period of temporary unemployment. 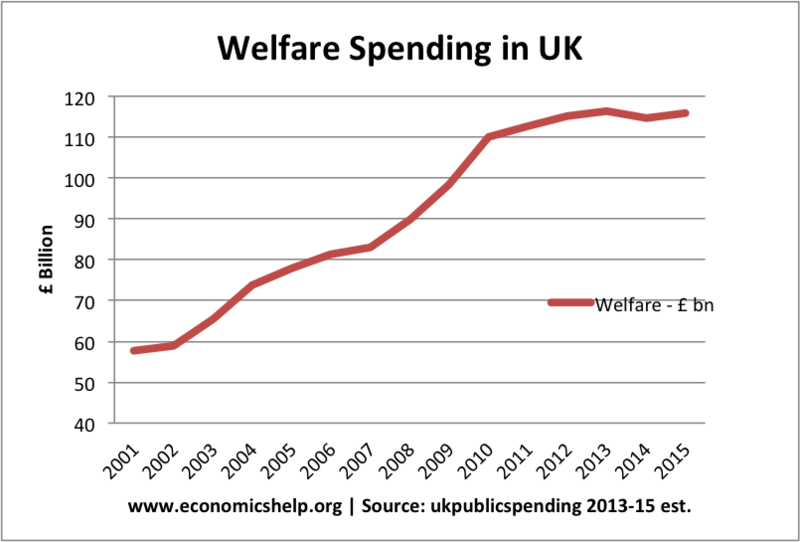 Since 2001, welfare spending has increased from £57bn t0 £115bn. However, the government are planning to stabilise welfare spending at £115bn through limiting entitlement and the increase in the amount paid. The government may argue without firm action now, the trend would see continued unaffordable increases in welfare. If we look at welfare payments in real terms (adjusted for inflation), we see the growth is less spectacular. 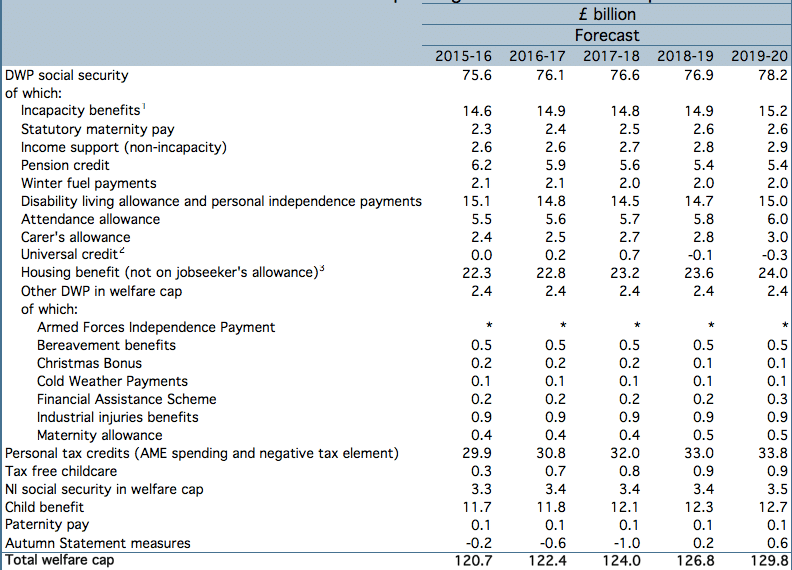 Nevertheless, even adjusted for inflation, the welfare bill has increased by £34bn since 2001. The figures for 2014 and 2015 are only estimates, and could be different. It should be remembered the biggest growth of welfare payments occurred in the deep recession, when unemployment increased and real incomes fell. Between 2007 and 2010, the welfare bill increased £20bn in just three years. But, this is what should be expected. The welfare state aims to provided security during periods of high unemployment. This increase should be seen as cyclical. If unemployment falls, and real incomes increase post 2013, the welfare bill should be reduced. 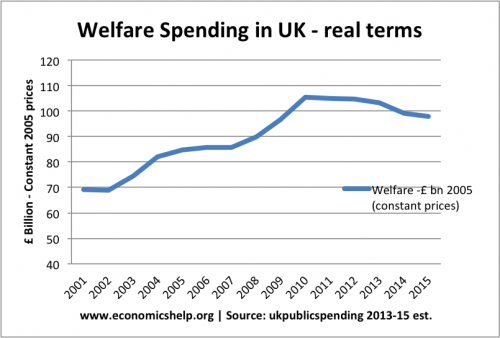 This cyclical welfare spending is an automatica fiscal stabiliser. In a recession, incomes fall, welfare payments ensure people have a minimum income. This also helps to prevent a bigger fall in aggregate demand. The most meaningful guide to the cost of the welfare state is to measure welfare payments as a % of GDP. If GDP is rising, we can afford to spend more on welfare payments, without increasing tax rates. Also between 2001 and 2012, the UK population increased by nearly 5 million. Therefore, the welfare payments per person increased slower than the total welfare bill. This suggests welfare as a % of GDP has stayed reasonably stable at 6% of GDP. There was an increase during the recession – which is to be expected as GDP falls and welfare payments automatically increase. The figures for 2014 and 2015 are estimates. Statistics such as this only show part of the story. To really understand the effectiveness of welfare payments, we need a close examination of each benefit, how it is spent and how it is claimed. The second headline probably wouldn’t sell as many newspapers. But, both statements are based on truth. (1) I think that winter fuel benefits is included in welfare, though I haven’t been able to verify. This entry was posted in economics and tagged benefits, welfare. Bookmark the permalink. ← The Best Form of Economic Stimulus?